“No patient wants to have to make unnecessary repeat visits or stay for long periods of time in hospital, and this work will crucially improve the experiences of patients undergoing often very invasive procedures. The seventh national report from the Getting It Right First Time (GIRFT) programme calls for work to continue on developing the ‘hub and spoke’ approach to oral and maxillofacial surgery, to ensure patients are receiving the best possible care according to their needs. 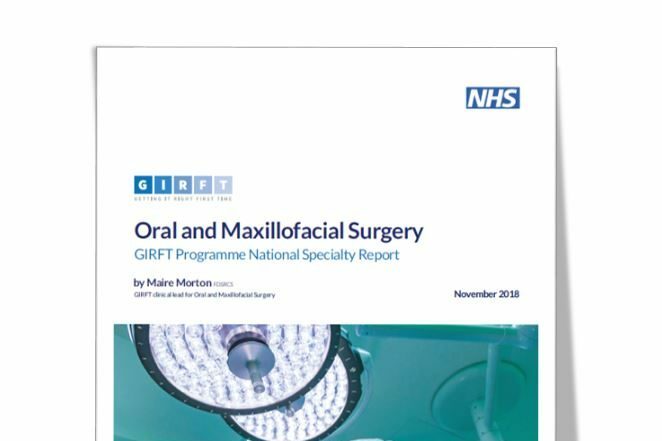 The GIRFT review into oral and maxillofacial surgery across England outlines the need to centralise services and build on existing hub and spoke networks for the specialty, especially in the treatment of patients with head and neck cancer and those needing corrective jaw surgery. This configuration will enable central hubs to focus on in-patient work, while outlying spoke hospitals take care of day cases and out-patients, which form a high proportion of oral and maxillofacial work. The report also urges providers to consider allocating dedicated oral and maxillofacial theatre time for emergency cases, which in turn will help prevent out-of-hours operations and the cancellation of planned procedures, and reduce pre and post-operative length of hospital stay. It further calls for a standard protocol to be introduced across the country to reduce unwarranted variations in the number of hospital follow-up appointments after surgery. In the most straight-forward of cases, eg; dental extractions (dentoalveolar surgery), the report suggests a target of zero follow-up appointments. Consultant oral and maxillofacial surgeon Maire Morton – who headed up the review – identifies 15 key recommendations after reviewing the data for 76 hospital trusts. To improve methods and techniques for data collection to ensure better analysis going forward. To look at why more simple surgery, such as wisdom tooth removal, isn’t being done outside of hospital, helping to free up resources. To develop local networks, such as ‘hub and spokes’, across the country, giving patients access to the most appropriate care for their needs. This is especially beneficial in care for head and neck cancer patients and those needing orthognathic (jaw) surgery. In support of this, GIRFT will work with NHS England on the development and implementation of the revised head and neck cancer service specification. To optimise the secondary care pathway by reducing the number of follow-up appointments required, especially for dentoalveolar surgery and releasing capacity to focus on other areas. These bring opportunities to improve the patient experience through shorter hospital stays, fewer admissions and fewer repeat visits. In turn, this could deliver cost efficiencies of up to £25m. Miss Morton said: “Our review has shone a light onto the specialty and allowed us to discuss the difficult issues that underlie variation in care pathways in oral and maxillofacial surgery, some of which add cost while adding no value to the individual patient. The improvement of data quality is a key issue highlighted in the national report. Miss Morton and the GIRFT team identified 127 hospitals carrying out oral and maxillofacial surgery in England but found data-gathering problematic. Among the 15 recommendations are seven relating to the quality of data collection, including the need for a guide for coders and clinicians alike, better training and more regular meetings between coders, trust teams and surgeons. Miss Morton said she found a lack of consistency in coding and no comprehensive set of clinical outcome measures for oral and maxillofacial surgery, making analysis of the specialty and its outcomes difficult. In response to this, the British Association of Oral and Maxillofacial Surgeons (BAOMS) has begun a pilot project to prioritise key clinical outcome measures to support benchmarking and continuous improvements across the specialty. “All surgeons wish to deliver best care for their patients, but without accurate and comprehensive data they cannot improve their service,” Miss Morton said. A further issue identified in the report is the significant amount of dentoalveolar surgery (including wisdom tooth removal) referred to hospital units. Miss Morton explains that the increased complexity of dentoalveolar surgery requires enhanced skills and a higher level of provision known as level 2 service. The report recommends developing a dentoalveolar surgery pathway that meets the differing needs of patients and that, where appropriate, the amount of dentoalveolar surgery carried out in a level 2 dental setting is increased. The recommendations are endorsed by the British Association of Oral and Maxillofacial Surgeons (BAOMS). They will be implemented in partnership with NHS Improvement and NHS England, as well as directly with hospital trusts, and Sustainability and Transformation Partnerships. “The GIRFT review of oral and maxillofacial surgery has demonstrated significant opportunities to improve patient care with better data quality and data collection. BAOMS has been working to have the OMFS specialty correctly coded, and I am particularly encouraged to see the prominence given in the report to coding and speciality attribution. “The review highlighted that the recording of Hospital Episode Statistics (HES) for OMFS was not as good as it should be to enable the data to be used as a national planning tool for capacity and resources.